The “Wait 2” Novari ATC module is widely used by hospitals and across health regions to improve OR utilization, enable better surgical wait list management and the paperless eBooking of cases from the physician offices to the hospital booking offices. In real time, Novari ATC complements and integrates with each hospitals’ surgical information system (Meditech, Cerner, Picis, SIS, etc.). Efficient utilization of expensive OR time & resources starts in the physician offices. The Novari ATC module leverages physician-specific average procedure times, including set up and clean up times, to ensure the physician offices’ scheduling requests do not exceed available block OR time. The percentage of OR utilization is visible and highlighted to the surgical offices for each block of OR time. Understand in real time the volume of cases in the pipeline (both scheduled and not yet scheduled) and demand for resources by department and services. Cases can be filtered by diagnosis, urgency, procedure, service, demographics, etc. Improving wait times for surgical care is a priority in Canada, Australia and many other healthcare systems. 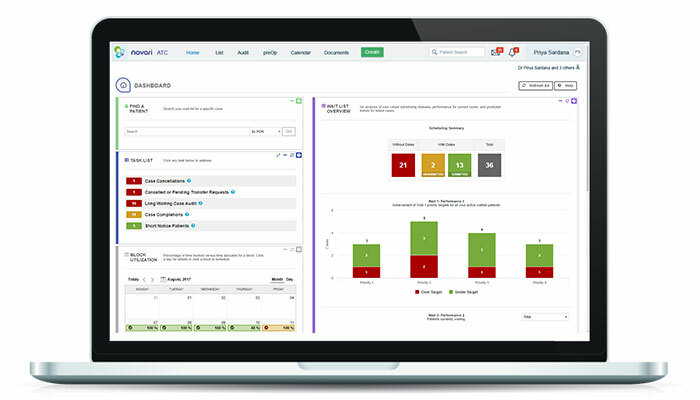 Sophisticated wait list management functionality and physician office dashboards are part of the solution and make it intuitively easy for the offices to pick the right patient at the right time, which improves compliance with provincial or local wait time targets. 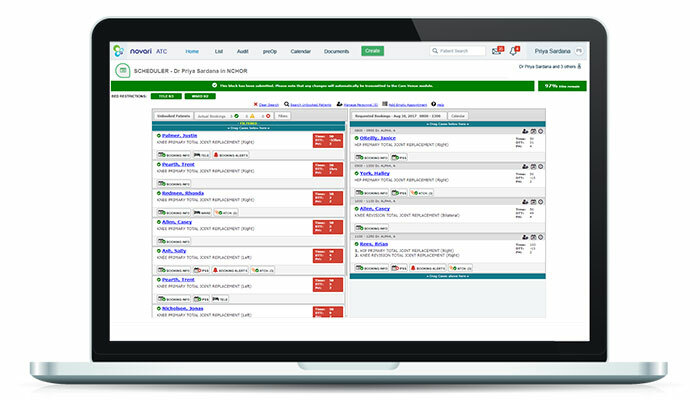 Deploying a wait list management system jointly used by the physician offices and the hospital improves wait times performance. Move to a paperless eBooking process by receiving bookings from the surgical offices with attached electronic documents (history & physicals, consent, etc.). Most Novari ATC clients have transitioned to a completely paperless booking process with all documents and communication between the hospital and surgical offices being electronic. It’s time to retire the 1980 fax machines. The perioperative process is complicated and involves the coordination of many individuals and departments. The Novari ATC’s messaging functionality lets the physician offices, scheduling offices, registration department and the pre-admission clinics securely electronically communicate with each other. No more telephone tag and misplaced faxes. Novari ATC™ integrates and complements existing hospital surgical and enterprise scheduling information systems (i.e. Meditech, Cerner, Picis, SIS, etc.). Electronic booking requests from the offices are received and processed by scheduling staff within the hospital’s existing scheduling system. 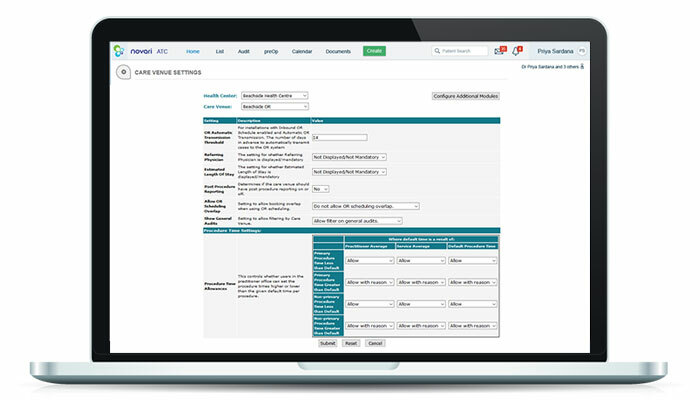 Make required wait times reporting easy by automating the opening, updating and closing of cases in provincial wait time registries (WTIS, PAR-NS, etc.). 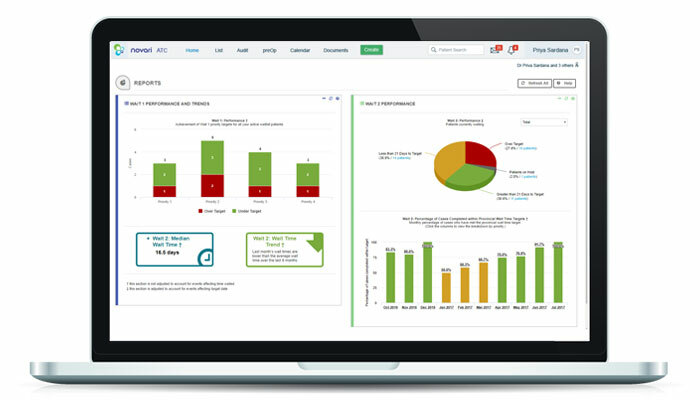 Practically error-free reporting means wait time coordinators spend less time managing reporting errors and more time working to improve wait time performance. Award Winning Technology Puts the NW LHIN at the Top of Provincial Rankings. Wait list management and case booking can be managed by either the physician office staff and/or hospital staff. Each physician office is provided with a colour coded wait list indicating the status of each patient on their list. The system allows the offices and the hospital to monitor long waiting patients and schedules accordingly. At the time of case scheduling, the physician offices send an electronic “scheduling request” to the booking office with all supporting electronic documents (i.e. consent form, etc.). In the absence of modern wait list software, physician offices or those responsible for managing wait lists often depend on unsecure and unencrypted spreadsheets, unique paper filing systems and other workarounds that are neither secure nor completely effective. 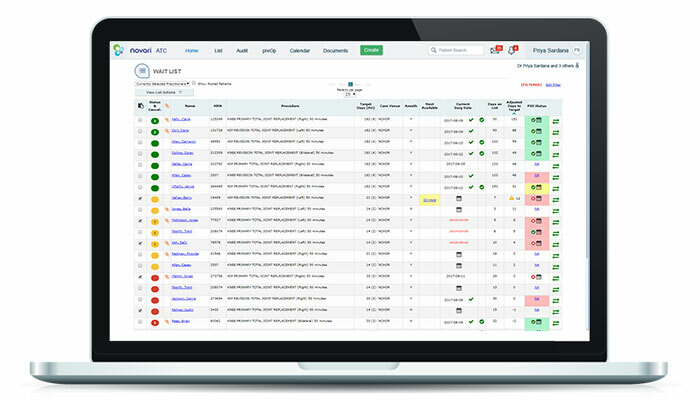 The fastest way to improve chronic wait times is perhaps the easiest and most often overlooked – wait list management software. 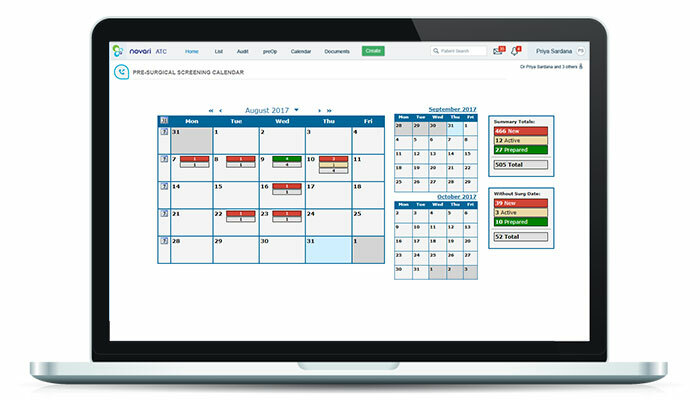 Streamline the booking process for surgical and other hospital programs by receiving all bookings electronically from the physician offices to your existing scheduling system (including required documents). The software is easy to use and improves the booking clerks’ ability to manage incoming bookings while providing program leadership with tools to better understand the volume of cases in the pipeline. Consults (Wait 1 referrals) received by a surgeon using the Novari eRequest module can be transitioned from Wait 1 to Wait 2 with the click of a mouse. For example, a GP may use Novari to send a referral to an orthopedic surgeon who in turn accepts the electronic referral and schedules the patient for a surgical consult. At the time of the consult, the surgeon and the patient agree to proceed to surgery. The surgeon or office staff simply indicate a decision to treat in the Novari eRequest module and the case is automatically added to the surgeon’s surgical wait list in the Novari ATC™ module. No unnecessary re-entry of data into different systems with a single software platform for managing both incoming referrals and for surgical wait list management / eBooking for patients proceeding to surgery. Novari ATC can be deployed at a single hospital, across all surgical sites within a health region or provincially. We recognize the wide variation in the workflows at hospitals, within hospitals and in the surgical offices. The Novari ATC module easily accommodates these variations via hundreds of configuration settings. This approach facilitates a blend of standardization and variation across a province, health region and at individual hospitals. Novari ATC brings innovation and simplicity to wait times, CJRR, GI Endoscopy DSP, ORBC reporting. It’s a proven and invaluable tool for those responsible for reporting wait times to provincial authorities and allocating resources to meet wait time targets. Designed in Canada by a team of clinicians and health IT experts, Novari ATC is compatible with and complements provincial wait time systems across the country (WTIS, PAR-NS, etc.). 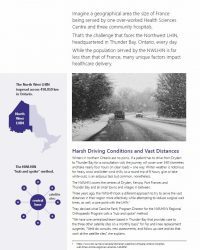 Novari ATC automatically feeds accurate wait time information to the province, strengthening the effectiveness of the provincial wait time system while eliminating the reporting for both physician offices and hospitals. The optional Novari Pre-Surgical Screening (Novari PSS™) sub-module can use local, national, or international clinical best practice directives (i.e. choosing wisely), the procedure and comorbidities to automatically determine the type of pre-admission clinic (PAC) appointment appropriate for each patient. In a patient-centric approach, scheduling of PAC appointments can be scheduled at the same time as the procedure booking by the physician offices. The PSS sub-module, using the same best practice standardized directives, can determine the pre-operative testing required for each patient in advance of surgery. Standardized pre-operative testing reduces clinically unnecessary tests and expensive last-minute OR cancellations while improving patient safety. Novari ATC uses RSA and AES with 256-bit end-to-end encryption and meets federal and provincial privacy legislation requirements. All data is secured in Canadian Microsoft Azure datacenters.